Ald. Ann Rainey (8th) at a city meeting. The Board of Ethics recommended that Rainey recuse herself from votes on Harley Clarke. The Evanston Board of Ethics advised that Ald. 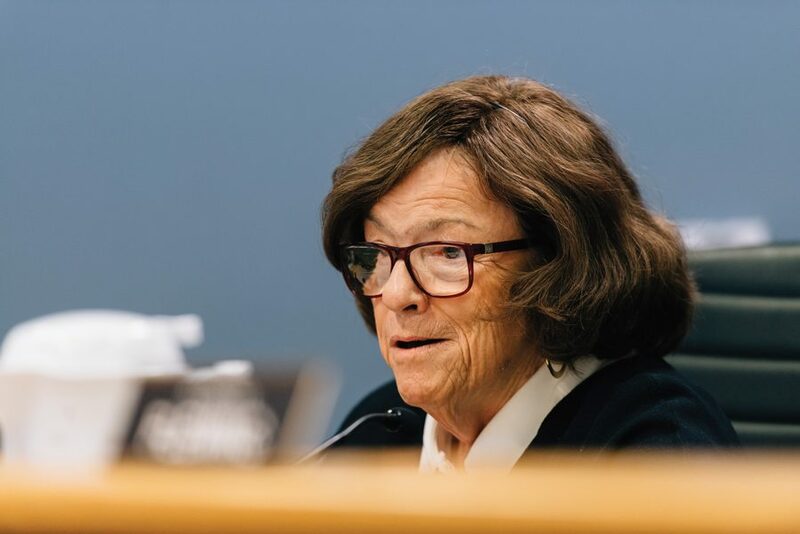 Ann Rainey (8th) recuse herself from voting on any future matters concerning the proposed demolition of the Harley Clarke Mansion, board member Karena Bierman wrote in an email to The Daily. “It was moved and adopted that recusal would be appropriate in light of the Board’s findings, but we do not have the authority to require it,” Bierman said. The recommendation accompanies the board’s findings that Rainey violated the Evanston Code of Ethics on three counts. The board reviewed two complaints against Rainey surrounding her involvement with the group Evanston Lighthouse Dunes, whose plan to demolish the Harley Clarke Mansion in north Evanston was approved in July. The first complaint against Rainey — filed by Nancy Sreenan, an Evanston resident who supports the restoration of the mansion — alleges that Rainey forwarded an email Sreenan sent to City Council to members of the Evanston Lighthouse Dunes group. The email urged the council to oppose the mansion’s demolition. After deliberating, the board found Rainey lacking impartiality because of “disparaging comments” she made about Sreenan in emails exchanged with members of the Evanston Lighthouse Dunes group, Bierman said at Thursday’s meeting. However, forwarding the emails was not found to be a violation of the Code of Ethics because the email was considered public, meaning there was no expectation of privacy. At Thursday’s meeting, Rainey declined to comment to the Daily about the board’s decision. Evanston residents Clare Kelly and Lori Keenan filed a second joint complaint, raising six claims against Rainey, two of which the board did not have jurisdiction over. The claims included that Rainey solicited funds for the Evanston Lighthouse Dunes using her city email, as well as mocked Keenan — including when she told Keenan “f–k you” and “don’t mess with me” following an Election Board meeting in August. The Board of Ethics ruled that Rainey violated the city’s statute of impartiality and abuse of power as an elected official. In its recommendation to City Council, the board advised that the council reminds elected officials to avoid partiality in speaking with constituents, including via email. Kelly said in an email to The Daily that the recommendation for recusal is the “most important piece” of the board’s decision. Keenan is unsure of how effective the recommendation will be, she said in an email to The Daily. The board’s ruling is not legally binding — it serves as an advisory opinion and will be presented to the Rules Committee and then to City Council. Findings from the Oct. 16 and 25 meetings will be summarized and reviewed at the board’s next meeting on Nov. 20.